This is a new series of posts that I decided to start after realizing that I'm not the only one who goes out and tries the things I see in dramas whether it be a new hobby or new foods. I'm going to share my own "Out of Drama Experiences" from some of the different times I've taken my interest from the dramas I've seen and tried them in real life. Japchae is a dish made out of glass noodles (noodles made from sweet potatoes) and stir-fried vegetables and sometimes meat. The first time I noticed glass noodles in a drama was in Answer Me, 1994. Now in that drama it was kind of silly because the mom, as she had a habit of doing, made way too much so here was this giant bowl of glass noodles. They may have shown Japchae in dramas I'd seen before, but I'd never noticed until now. The noodle color and texture was so cool. The noodles were practically translucent. I knew right then and there that I wanted to try them. Shortly after this I was talking to a Korean customer at work and telling them how I wanted to try more Korean food, but at the time I was avoiding meat. She told me that I had to try Japchae. I agreed that I wanted to. Now unfortunately there are no Korean restaurants in my town so I have to go at least a half hour away to get to one so I doubted I'd be able to try Japchae any time soon. But then in browsing the Korean cooking channel on my Roku, I came across a simple and delicious recipe for Japchae. The recipe comes from The Squishy Monster blog and you can find it here. The whole blog is great, really. She features a wide variety of Korean recipes with simple instructions and a video demonstration as well. I've tried a few of her other recipes and they're phenomenal. So anyway after I found the recipe, I got directions to the nearest Asian market. It turned out to be just down the road and I was in heaven the minute I walked in. You'd better believe I came out with a basketful of fun snacks from across Asia along with the glass noodles I had been looking for or Dangmyeon (당면) as they are labeled in the store. I by no means am a great cook, but I am decent at following directions and it turned out pretty good the first time I made it. It's much better now that I know what I'm doing and have made it a few times. So the synopsis? I am a Japchae fan! I love the taste of the vegetables and chewiness of the noodles. This is not something that I eat all the time or in large portions, though, because there is a lot of sesame oil involved. But I would say it's a definite must for all those looking to try more Korean foods. 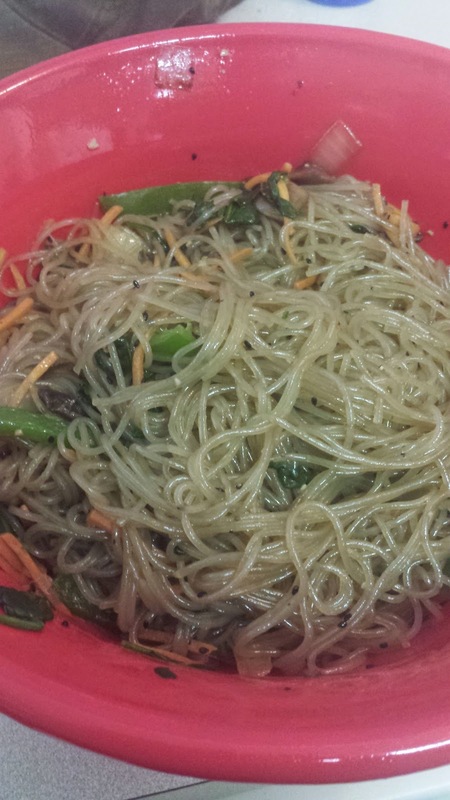 That was my Out of Drama Experience with Japchae. Stay tuned for more of these Out of Drama Experiences in the future!